W I T H I N OU R F L EE T, P ORT C RU I SE A DV EN T U R E S H A S T H E P E R F E C T V E S SE L F OR YOU R N E X T F U NC T ION OR A DV EN T U R E ON T H E BE AU T I F U L H A S T I NG S R I V E R OR T H E S C EN IC P ORT M ACQ UA R I E C OA S T L I N E .
OCEAN BLAST Experience one of the fastest boats in NSW with gripping acceleration, giant turns, riding waves and swell! An unforgettable 35-45 minute ride along the beautiful coastline from the North Shore to Lighthouse Beach. ECO TOURS We are the only vessel that can access the nature reserve area of the Hastings River. Enjoy the unique sights as we venture through the oyster farms into Limeburners creek where there is a variety of wildlife to see. SUNSET CRUISES A great way to end the day with your family and friends cruising the Hastings river and canals. Enjoy the sunset as we journey back with chance of seeing dolphins and an array of other wildlife. BYO food and drink. 30min or 1hr hire in out 9 hectare ski park! Meet Nicola McLeay, a New Zealand born Professional Fine Artist and Lighthouse Gallery Owner living in Port Macquarie and the Artist that painted our stunning cover. She is a Realism Painter specialising in finely detailed brushwork. Her focus is on translating the beauty she sees in the world onto an eclectic range of media surfaces, using Oil or Acrylic mediums. She produces original Australian & New Zealand Landscapes, unique Snowboard and Surfboard Art, Human Figure and Charcoal Portraiture. For more of her amazing work, see page 21. For more Inspiration+Information visit discoverportmacquarie.com.au @discoverportmacquarie @discoverportmacquarie #discoverportmacquarie PUBLISHER: discover MEDIA AUSTRALIA PO Box 9310, Port Macquarie NSW 2444 Phone (02) 6581 5600 discoverportmacquarie.com.au ADVERTISING SALES: Andrew Kowalewski (02) 6581 5600 / andrew@discovermedia.com.au LAYOUT+DESIGN: Jeff Cowan / cowan-creative.com.au or behance.net/jeffcowanac98 COVER: Watonga Rocks, Lighthouse Beach by Nicola McLeay Fine Art, Lighthouse Gallery 0459 514 929 PHOTOGRAPHY: Andrew Kowalewski. Special thanks to the Port Macquarie Historical Society (p4), Jodie Lowe (p10), Lindsay Moller Productions & The Stunned Mullet (p11, 42 & 43), Tim Hitchins Overall Photography MNC (p12), Billabong Zoo (p18). DISCLAIMER: Discover Magazine is copyright. Whilst every endeavour has been made to ensure the accuracy of all information in this publication, the publisher cannot be held responsible for any consequences resulting from misdescription or inadvertent errors contained herein. No part of this publication may be reproduced, altered or copied in any way without written permission of the publisher Discover Media Australia. 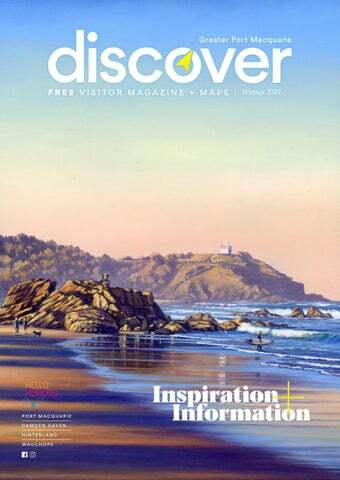 Discover Magazine is an independent magazine designed just for you â&#x20AC;&#x201C; the visitor to this great region. Have a great stay and please remember when you are out and about, let our advertisers know how you found them as it is only with their support that we can continue to bring you this free visitor magazine. St Thomas’ Anglican Church – Australia’s fifth oldest church is still in use. Built by convict labour between 1824 and 1828 the walls are constructed of one metre thick hand-made brick. It features an 1857 barrel organ that plays 33 hymns – the only one of its type in Australia. Mon-Fri 9.30am-12 noon and 2pm-4pm 50 Hay Street - Map ref K8 (02) 6584 1033 Historic Roto House was built in 1891 and belonged to the Flynn family. In the early 1980s it was restored by the National Parks and Wildlife Service and features furnishings and artefacts from the 19th Century. Pack a lunch and picnic in the pleasant surrounds of Macquarie Nature Reserve, or visit the nearby Koala Hospital. daily from 10am-4.30pm subject to volunteer availability Map ref L10 (02) 6584 2180 Douglas Vale Historic Homestead + Vineyard is possibly one of Port Macquarie’s best kept secrets. It is the only heritage listed vineyard and museum in Australia that is run completely by volunteers and it represents the last remaining vestige of a pioneering wine industry dating back to 1859. See page 40 for more details. PORT MACQUARIE IS THE PLACE TO CELEBRATE ONE OF AUSTRALIA’S MOST ICONIC ANIMALS - THE KOALA. HERE YOU CAN NOT ONLY GET UP CLOSE AND PERSONAL WITH OUR FURRY FRIENDS AT BILLABONG ZOO (SEE PAGE 19), YOU CAN ALSO VISIT THE WORLD’S FIRST KOALA HOSPITAL, OR TAKE THE HELLO KOALAS SCULPTURE TRAIL TO SEE OVER 60+ BEAUTIFUL KOALA SCULPTURES. to produce a greenish substance called ‘pap’. This is passed down from the caecum, a specialised section of the intestinal tract where fermentation of the leaf occurs, for the joeys to eat. The ‘pap’ contains vital micro organisms (bacteria) that inoculate the joey’s gut system to enable them to digest eucalypt leaf. Without pap, a joey cannot eat eucalypt leaf and will not survive. From around six months of age, the joey will start emerging onto the mother's belly and by eight months the joey becomes a ‘back young’, staying on or near the mother. By 12 months, the koala is usually weaned. Female koalas are excellent mothers, and are highly protective of their young. Elaine Burke pioneered the award-winning Larkin with Toads public art trail in Hull in the UK - winning Silver for the Best Tourism Event in the VisitEngland National Awards in 2010, and beating the Grand National. As Elaine explained, similar animal sculpture trails are usually exhibited for a couple of months and then dispersed. located Hello Koalas has defied this trend; instead the Port Macquarie Trail has grown in size from 50 to 66 Hello Koalas sculptures, BAGO with more on JIMMY BLOSSOM Artist Artist the way. there are around 10 located right in the heart of town and a further 20 sculptures a short drive away, in high profile locations such Sea Acres Rainforest Centre, so even if you are in Port for just a day or two, you can easily see around 30 sculptures on the Hello Koalas Sculpture Trail. Hello Koalas sculptures are sponsored by local business and community groups, making the Hello Koalas Sculpture Trail freely available for everyone to enjoy. How good is that! Don’t forget to takes lots of photos and post them on facebook or Instagram and the Koala Hospital Hello Koalas sculptures are always pleased to receive 5 star reviews on TripAdvisor! You can also collect a Hello Koalas memento from one of the local stockists or purchase online from home. Resident at the Koala Hospital, Hello Koalas sculpture Jimmy says ‘Hi” to a friend. Photo Lindsay Moller. Byabarra Cafe. Bar. Bakehouse. Cafe. Byabarra Bakehouse. Bar. Some Hello Koalas sculptures are travelling on exhibition over summer, including Topiary 17 and Kalido 18 Other sculptures locations may change also. Please check www.hellokoalas.com for details. Stoney, the koala, meets Stoney, the Hello Koalas sculpture, at Billabong Zoo, Port Macquarie. Artist Bruce Whittaker. Photo Lindsay Moller. Say Hi to Oceania at McDonalds Gateway, Mr T at KFC Gateway, Crusader Koala at Sea Acres Rainforest Centre and Guula at Wauchope Railway Station (pictured above). The Trail was also a Finalist in the 2017 Australian Tourism Awards and has won NSW Tourism Awards in 2015, 2016 and 2017. Ranked #3 of 81 Things to Do and #1 Landmark in Port Macquarie by TripAdvisor. Disclaimer: This map is the property of Arts and Health Australia. The map is not to scale and is provided as a guide only to the Hello Koalas Sculpture Trail. Whilst all care has been taken when completing this map, Arts and Health Australia accepts no liability for any inconvenience, damage or injury whatsoever that may occur by reliance on the information provided. Please check the Hello Koalas Sculpture Trail website for regular updates or to download the most current Trail Guide as a pdf - www.hellokoalas.com © Hello Koalas Sculpture Trail. All Rights Reserved. Images and sculpture designs may not be reproduced without permission in writing. Recent Awards include Gold for Cultural Tourism and Silver for Tourist Attractions in the 2018 North Coast Tourism Awards and Winner, 2018 NSW Business Award for Excellence in Innovation. For a large selection of Hello Koalas Memorabilia, call in to the Shop at Sea Acres Rainforest Centre, 159 Pacific Drive, Port Macquarie. Hours of Opening: 9am to 4.30pm 7 days. Hello Koalas memorabilia includes T-Towels, Colouring Books, Magnets, Badges, Notebooks, Postcards, Bookmarks, Coasters and the 2019 Hello Koalas Calendar. A small selection of Hello Koalas Memorabilia can also be found at the Koala Hospital, BP Pacific Highway Service Centre, Ricardoes Tomatoes and Strawberries and the Glasshouse Arts and Visitor Centre. Hello Koalas Sculpture Trail is a major award winning attraction! Announcing the brand new Hello Koalas Festival Treasure Hunt. Lots of prizes to be won. Check out details on www.hellokoalas.com or Hello Koalas facebook page. â&#x2020;&#x201C; ABOVE Whale off coast of Port Macquarie by Jodie Lowe OPPOSITE (CLOCKWISE FROM TOP) North Shore, SUPing at Town Beach and The Stunned Mullet. WITH ITS IDYLLIC CLIMATE, STUNNING BEACHES, NATURAL BEAUTY AND PERFECT POSITION NESTLED BETWEEN SYDNEY AND BRISBANE, IT'S NO WONDER PORT MACQUARIE IS EXTREMELY POPULAR WITH VISITORS AND LOCALS ALIKE. AS ONE OF THE FASTEST GROWING REGIONS IN NSW. SEA CHANGERS AND TREE CHANGERS ARE FLOCKING TO OUR PATCH OF PARADISE. Port Macquarie. Port Macquarie (or "Port" to locals) offers the visitor so many opportunities to share our fabulous lifestyle. Apart from enjoying our relaxed coastal vibe or taking in the breathtaking scenery of our hinterland, there are a myriad of events throughout the year to enjoy - from food, wine and beer festivals, music festivals to major sporting events, there is something for everyone. Visit our website for this season's major events. Recently we have been recognised as a World Festival & Events City by the International and Events Association. Port can proudly claim that is has become a food-force to be reckoned with, with many restaurants and cafes truly embracing the locavore tenet. From a sublime dining experience at our one-hatted restaurant to a relaxed coffee, juice or smoothie by the beach, Port Macquarie has it all! Wauchope (Pronounced war-hope) - 20 minutes west of Port Macquarie. Surrounded by Australia’s most extensive Blackbutt forest, it was here in the mid 1800s that pioneers made the town famous as a timber town. Today, Wauchope is the gateway to the hinterland and has many unique businesses and fabulous boutique shops with friendly old fashioned service. As an RV Friendly town, and the first Motor Cycle Friendly Town in NSW, Wauchope makes for a great stop or a day out. If you’d like to taste some of the region’s fresh and tasty produce, head to the Wauchope Farmers’ Markets at the Wauchope Showground held every 4th Saturday of the month. Abundance Garden Centre and Lakeside Dining Ideally situated just a three minute country drive off both the Pacific and Oxley Highways at Sancrox. Located at the Vanderley Nursery site, this beautiful complex is a popular destination for locals and tourists alike. The wholesale production nursery supplies professionally grown and conditioned plants to Abundance Garden Centre - a bonus for gardeners and landscapers in the Hastings area and beyond. An excellent selection of pots, water features and garden art complement the green-life. John van der Ley and his team of horticulturalists offer expert advice and friendly service for all gardening requirements. Complete your experience at Abundance Lakeside Dining where you can sit back, relax and dine overlooking the picturesque lake. An innovative and exciting menu prepared by a young and passionate team is offered 7 days a week. You can enjoy breakfast, lunch, delicious morning or afternoon teas, and dinner on Friday and Saturday nights. Take a drive down into the country and experience Abundance for yourself! Closed public holidays. Hinterland To the west of Port Macquarie is true paradise, with breathtaking scenery of rolling hills and lush rainforest. The Hinterland is a truly spectacular sight and is popular with bush walkers, four-wheel drive enthusiasts or those just keen to explore. Take time to discover this region with a day trip or two. Perhaps stay overnight in one of the many cottages or B&B’s scattered along the way. We have outlined some trails you may like to try, or you may prefer to make up your own, but whatever you do don’t miss this vast area of natural beauty. Bellrowan Valley Horseriding has some wonderful trails if you want to take in the breathtaking views on horseback – located in Beechwood, just north of Wauchope. South of Lake Cathie, Bonny Hills boasts some of the best coastal views in the region. It is home to the stunning Rainbow Beach, a huge expanse of white sand that goes on forever. The beach is patrolled during summer and has a fantastic picnic and BBQ area with playground equipment. Not only popular for swimming, Rainbow Beach is also an excellent surfing beach for both body boarders and surfers. A tranquil place of rolling green pastures, forests, streams and waterfalls located about a 1 hour drive from Port Macquarie. Here you’ll find the Boorganna Nature Reserve, a large remnant of the forest that once covered the whole plateau. There is a fantastic 2.7km walking track that starts at the picnic area where you can see many differing bird species and lush rainforest plants. Allow a few hours for this.While in Comboyne, you must drive a further 25kms to visit Ellenborough Falls in the Manning Valley - a truly amazing sight as water plunges into a gorge 200m below. There is a viewing platform and a timber walkway for those who would like to walk to the bottom of the falls. Whilst the road is mostly unsealed, it is definitely worth the trip (allow around 45 minutes for the drive from Comboyne). They have two walks, one 500m to the lower falls, and another 700m to the knoll plus there is a Kiosk and picnic facilities which makes it a great lunchtime stop. Stockists of the largest range of plants in the Hastings region. The massive pond water feature sets the scene for a relaxing real life experience of plants, pots, water features, landscape supplies...everything. Upon entering you’ll find spacious, sealed car parking, and wide wheelchair friendly pathways. Or just come and relax with a great cup of coffee and lunch at The Garden Cafe that overlooks the magnificent dam. The menu is extensive, and coaches are welcome. Then continue to browse through the Garden Centre where you’ll find many fantastic gift ideas, beautiful garden ornaments and water features in their newly renovated gift shop. (See ad page 14). is one of Australia’s most impressive coastal panoramas. The area is characterised by large stands of rainforest which are rich in native fauna and flora.Take a picnic as they have excellent facilities. Three walks of varying length and difficulty are available if you are feeling energetic. The mountain supports a wide range of vegetation communities, including some of the best examples of old growth blackbutt forest in NSW and pockets of sub-tropical rainforest that provide habitat for gliders, bats and koalas. Laurieton Residential Resort Laurieton Residential Resort has a very limited number of new homes left in its third and final stage of building! Currently they have a selection of stylish move-in ready homes, or you can build your own home, personalised to your taste and to suit your timing. Premium position homes with immaculate upgraded finishes are available from $490,000, with more affordable options also available. Featuring first-class amenities, quality homes and spacious lots, the resort is set amongst tall timbers, beautiful landscaping and adjacent to Queens Lake. Best of all.....NO STAMP DUTY and NO EXIT FEES! Over 55s Living never looked so good. Camden Haven. North Haven Takeaway & Café A great spot to stop and grab a bite to eat or enjoy a nice cup of Holy Goat coffee. With a park and picnic area opposite and the waterfront nearby, this surf themed cafe offers a great choice of burgers, fresh beer battered fish and chips, homemade hand cut scallops, fresh sandwiches and wraps. Cool down with a mouth watering scoop of ice cream - 24 flavours to choose from - and pick up a loaf of bread and some milk. Open 7 days from 8am until late and extended hours during the holiday periods. Dunbogan Just past Laurieton, Dunbogan is a little piece of paradise. Beautiful beaches and river fishing make it a unique location catering for everyone. This is home of Kattang Nature Reserve, which boasts the most magnificent views. Enjoy wildlife and native flowers on one of the two walking tracks (see page 28). Pilot Beach A fantastic and secluded beach for the kids, as it is naturally protected. It also has excellent BBQ facilities and a playground area with showers to rinse off. Crowdy Bay National Park Take the road from Laurieton and head south and you will enter the northern section of Crowdy Bay National Park. This area of parkland was first sighted by Captain Cook in 1770. He saw Aborigines standing on what is now known as Diamond Head and named the promontory Indian Head. In more recent times a man named Ernie Metcalf lived on the headland. He was the subject of ‘The Man on the Headland’ written by Kylie Tennant. He built a hut for Tennant who subsequently gifted it to the park. It was restored in 1980 and is now one of the park’s attractions. Diamond Head itself is quite striking. It rises 113 metres and is edged by the wetlands and heathlands of the coastal plain. The park is ideal for bushwalking, birdwatching, fishing (from the rock platforms you can catch groper, bream, tailor and drummer) and swimming. Zoo CafĂŠ Breakfast & lunch, daily specials Zoo Shop Souvenirs & great gifts Zoo Kids Children's play area & all day walk-through kangaroo & wallaby feeding area. Zoo Talks 16 FREE keeper presentations daily (included in entry fee) + reptile show at the weekends and holidays. IN A REGION BLESSED WITH BEAUTY, IT IS HARDLY SURPRISING THAT A TALENTED ARTISTIC COMMUNITY FLOURISHES IN THE GREATER PORT MACQUARIE REGION. Crystalline Gallery – Rod Page has been supplying galleries throughout Australia for the last 35 years and now his studio is open to the public. Rod’s unique pieces look like they are made of sapphires or diamonds. There are vases, platters, lamps, water filters as well as tiles and vanity basins in a wide variety of colours. See how the clay is transformed into an elegant piece of art. Galleries +Exhibitions. Arthouse Industries is a unique Glass studio where you will find beautiful handmade gifts, clothing and artwork. There are Lampwork glass demonstrations and you can also attend workshops. Skye is an award-winning glass artist specialising in jewellery who demonstrates from the studio, allowing you to see her work with molten glass to create amazing wearable art. The space is a creative indulgence showcasing unique work from regional artists as well as a beautiful gift boutique. This is a must see to fill in a quiet afternoon and watch beautiful beads evolve from glass and flame and purchase a unique gift or piece of clothing. Open Monday - Friday 10am-5pm, Saturday 10am-2pm. Long Point Vineyard + Art Gallery is renowned for its boutique wines, breathtaking views and friendly staff. Amongst the picturesque vines lies their delightful cellar door and art gallery. Here you can taste fine wines, alcoholic ginger beer and liqueurs whilst viewing art from the region’s talented artists. Wander the grounds and experience the stunning outdoor sculptures. Picnic or barbecue on the wooden deck whilst the kids play in the cubby house. Beautiful location for a wedding or special event. Truly a must to visit. Now in their sixth successful year, Stitched ‘N’ Framed is Port Macquarie’s biggest Patchwork Shop. Find fabrics online and in store. Lark, Kylie and Kathy come with many years of patchwork experience. They specialise in modern, pretty and reproduction fabrics. They are the home of Port Macquarie’s Modern Quilt Guild. They are a Dealership for Bernina, Janome, Baby Lock and Handy Quilter machines. The shop now boasts two workshop areas where social sewing groups meet and classes are held by local and well known visiting tutors. Under the one roof is Custom Framing by Jenny and Sue of SuziQ Quilting with her long-arm quilting machine to complete your masterpiece. Their mission is to promote and develop patchwork, quilting and textile art within Port Macquarie and surrounding districts and to provide the community with a fun place to get together, make friends, share knowledge and learn. Lighthouse Gallery is a private exhibition space showcasing original artworks by local realism painter Nicola McLeay. Recognised internationally for her finely detailed brushwork, Nicola was a finalist in the Australian Wilson Art Awards, The International Art Competition and 1st in the 2018 Port Macquarie Annual Easter Art Exhibition Open Section. Lighthouse Gallery focuses on sharing with the public one-off pieces that are for sale of the region and wider parts of Australia and New Zealand. Leasing options and personalised commissions are available in a range of canvas sizes. The works on show change frequently as new pieces are completed. Visiting the gallery can easily be arranged by appointment or when it is open for public viewing. THE GREATER PORT MACQUARIE REGION OFFERS YOU A CHOICE OF 17 BEAUTIFUL BEACHES STRETCHING FROM PORT MACQUARIE THROUGH TO DUNBOGAN/CAMDEN HAVEN. book a lesson or board hire today. If you have some questions drop into their booking office at 46 Pacific Drive right opposite Flynns Beach or call them on 6584 7733. If you are looking for calmer waters and a great place to take the little ones, there are couple of options to choose from - all of which require parent supervision. With its rocky outcrop, Shelly Beach creates a somewhat protected lagoon and is ideal for the littlies. Other good areas for kids include Settlement Point, Lake Cathie lagoon (when open to the ocean) and Pilot Beach in Dunbogan. Town Beach is also good with a long break and plenty of rock pools towards the point for the kids to explore. are all popular spots. If you want somewhere to get your 4WD dirty, try North Beach, Lighthouse Beach, Rainbow Beach, Grants Beach or Dunbogan Beach – all of which have a 4WD entrance. A licence is required for recreational fishing (service.nsw.gov.au) and you also require a permit to drive on the approved 4WD beaches. Beach driving permits are available from the Visitor Information Centre located at the Glasshouse, Cnr of Clarence & Hay Streets. Map ref K8. For more information about beaches, please see page 22. Learn from Surfing Australia qualifed coaches at Port Macquarie’s award winning surf school. Lessons 7 days a week, all year round. 46 Pacific Drive Flynns Beach Map ref N11 T&Cs: *Wetsuit use available for board hire period. **1/2 day minimum board hire required. Delivery to Port Macquarie accommodation providers only. HUMPBACK WHALES FACTS • Humpback whales are the most acrobatic of all the great whales. • A whale's tail or fluke is unique to each whale and is what is commonly used to identify an idividual whale, just like a human fingerprint. • A baby whale is called a calf and weighs nearly one tonne when born. They consume up to 600 litres of their mother's milk per day. IN OUR NATIONAL PARKS, RESERVES + FORESTS. Starting at Westport Park in town (page 64, map ref H8), all the way to Tacking Point Lighthouse, the walk takes approx 3.5 hours. Putting your best foot forward - a definite ‘must do’ activity when in	Port Macquarie is the Coastal Walk - a 9km easy-grade walk that follows one of the most dramatic and inspiring coastlines in NSW. This walk features beaches, headlands, historic sites, rainforests and fantastic views. access to the headlands, viewing platforms and picnic shelters. Opportunities abound for viewing dolphins plus there is a variety of birdlife and the annual whale migration from May to November. The Coastal Walk is the result of a partnership between Port MacquarieHastings Council and the National Parks and Wildlife Service (NPWS), with both organisations contributing infrastructure along the walk. For your convenience, Council and the NPWS have installed quality signage on topics such as local history, whale watching and underwater ecology. 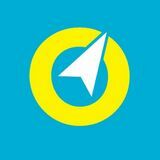 Maps are also featured to make it easy for locals and visitors to enjoy and use the walk. A few tips will help to make your walk more enjoyable for you and others: • Keep to the track and keep away from cliff edges. • Beware of traffic when close to the road. • Please take rubbish with you or use bins provided. • Dogs are not allowed in the Sea Acres section anywhere south of Shelly Beach. • Remember to take water and have adequate sun protection. PRAM FRIENDLY SECTIONS include Westport Park to Oxley Beach (south), and Kenny Walk (Nobbys Beach to south Shelly Beach). MICHAEL BURKHARDT AND HIS FAMILY HAVE SPENT THE LAST SIX YEARS CREATING AN AUTHENTIC FOOD EXPERIENCE FOCUSED ON SUSTAINABLE GROWING METHODS AND PURELY ORGANIC INGREDIENTS WHERE POSSIBLE. Walking down Short Street in Port Macquarie, you’ll be greeted with a number of ways to inspire your inner foodie. It’s quickly becoming a speciality food strip where you can find anything from those hard to source Asian ingredients to some of the tastiest bread and desserts that you’ve ever tried. There’s one little shop with a modest façade, a warm and welcoming counter and normally a line-up of people excited to get the day’s fresh treats. From first glance, this place has a lot more going on than most people would expect. Behind the doors of this German inspired Bakery, which has been a local business on the scene for the last 12 years, Michael Burkhardt and his family have spent the last six years creating an authentic Food Experience focused on “real” food, sustainable methods and utilising as many purely Organic ingredients as possible. The term “Organic”, for this German Pastry Chef/Baker, is definitely more than just a current day marketing term - it’s a way of growing, sourcing and baking on a day-to-day basis. lower in cholesterol and has significantly higher iron levels than that of common breeds and is used in his sensational meat pie and sausage roll range, of which there are Gluten Free options as well. The dedication doesn’t stop there - Michael is also fully committed to sustainable practices and chooses to use an Organically grown flour. He also uses “Salt Of The Earth” hand harvested sea salt and fully filtered, fluoride-free water in all of his products. With this kind of passion for their products, it is no wonder that Michael’s daughter, Ashleigh, has joined in the food side of things by preparing her own line of Vegan Raw Slices, which are refined sugar free, dairy free and gluten free. Her desserts are packed with nutritious ingredients and flavour. The only way to believe it is to try some for yourself! So the next time you’re strolling down Short Street and notice the boutique food stores that may inspire your cooking, be sure to pop into Burkhardt’s Organic Bakery and taste the difference of what experience and a passion for healthy and sustainable food is like. "AN AUTHENTIC FOOD EXPERIENCE FOCUSED ON “REAL” FOOD, SUSTAINABLE METHODS AND UTILISING AS MANY PURELY ORGANIC INGREDIENTS AS POSSIBLE." Relax your mind, body and soul... there’s no better time to pamper yourself than when you are on holidays! Take advantage of some precious me time by browsing our beautiful local boutiques (including fashion, accessories, jewellery), and take home that unique something special. Or book in for some well needed relaxation time at one of the wonderful health and beauty services on offer here. → Meg+Me Boutique + Espresso Come and experience a little slice of Melbourne, right in the heart of Port! Meg + Me Boutique + Espresso offers discerning customers the ultimate retail therapy experience. The clever combination of boutique shopping together with a “hole in the wall” style espresso bar creates a relaxed, comfortable environment where everyone is made to feel welcome. Allow Lusanna and "The Girls” to style an outfit for you from their exclusive labels including ELK, The Ark, Lounge The Label, POL and more, or select that perfect gift from their bespoke collection of jewellery, leather goods, accessories, Glasshouse Candles and homewares. Situated on the sunny side of the street, this little oasis is also home to Ant's onsite espresso bar which is well known among the locals for consistently outstanding coffee and service. ↓ The Arctic Studio Relax, recover and refresh! The newly opened Arctic Studio combines mental and physical relaxation. Let your troubles float away in their Dreampod Floatation Tanks, which helps to generate mental and physical calmness, enhance sleep and aid in reducing stress and anxiety. Just 1 hour of floating is equivalent of up to 8 hours of deep sleep! Get ready to chill with their Cryotherapy sessions and take advantage of extreme temperatures as low as -162 degrees to aid in pain management, decreasing recovery time and improving athletic performance. Cryotherapy can even increase collagen production, reducing wrinkles and tightening the skin for a more youthful glow. Chilling out for just 3 minutes can also stimulate weight loss! Remove harmful toxins and cleanse the body from the inside out with their Far Infrared Sauna. Experience the benefits of removing toxins, leaving you feeling refreshed, improved energy levels, reduced fatigue and enhancing skin rejuvenation. Turning up the heat in a safe environment helps boost muscle relaxation, leaving you refreshed to train harder. (See ad page 37). ↑ Arthouse Industries A must visit for one of a kind gifts including unique hand made jewellery, ceramic, silver, glass and mixed media, homewares, women’s clothing and art. Watch local award winning glass artist Skye work with molten glass to create one of her beautiful jewellery pieces right there in front of you in the shop studio. With a focus on Australian designed and locally produced, you’ll also find a selection of art from local artisans including paintings, sculptures and prints. This creative space is the perfect place to find that unique piece for yourself or someone special. Open Monday to Friday 10am – 5pm, Saturday 10am – 2pm. ↓ Vanity Medi Spa Led by Bethmay Jones, the dedicated and friendly team at this unique one stop Beauty/Dermal Clinic will treat you to the ultimate experience - relax and prepare to be pampered in our new-look tranquil premises! Their chosen professional skin care line is results driven SOTHYS, and their expanded product range includes Pure Fiji, Sunescape, Bestow Beauty, Sienna Byron Bay, Wrinkles Schminkles and Baby Foot. With their double room, picturesque marina location and ample parking, it’s the perfect spot for your time-out! Specialised treatments include anti-ageing Facial treatments, Dermal treatments of Microdermabrasion, Skin Needling, Clinical Peels, Dermalux LED therapy & de-stressing Body Rituals. Extremities of Hands and Feet, Tanning, Makeup, Hair removal of Waxing & Threading, Henna Brows, Tinting and Lash Lifting. Treat yourself – Vanity Medi Spa is all just for YOU! → Port Macquarie Day Spa Escape to tranquillity, with friendly professional staff, amazing results driven products and a huge variety of treatments at Port Macquarie Day Spa. Located at the Rydges Port Macquarie Complex, Port Day Spa has a well-deserved reputation for the excellence in services they provide. Offering relaxation therapies as well as paramedical treatments including hydrodermabrasion, micro needling and permanent hair reduction. Therapists are trained to the highest standards and are dedicated to providing you with the ultimate spa experience. Beautifully presented, newly renovated rooms complete with couples room and hydrotherapy spa. Your treatment will always be performed to the same high standard each and every time regardless of whether you are their first guest for the day or their last. Sophisticated relaxation is the name of the game for the Winter season at their new store location at Colonial Arcade. With a lovely array of stock, quality service is always the focus here and their goal is to create wearable, comfortable lifestyle dressing with Australian and International labels. Wrap yourself in luxurious knits or velvet for glamour with ‘Johnny Was’. ‘POM Amsterdam’ have a variety of shawls with vibrant colours, and blouses with whimsical designs. 'Monari' fashion is all about living comfortably - now is the right time to live your life in style with their fashion themes that fit together. Winter is bright at Emerald & Me and they look forward to welcoming you for a happy retail experience! Pacific Highway but light years from the hustle and bustle. Enjoy a guided wine tasting of Bago’s locally produced wines at cellar door. After the wine tasting enjoy a local cheese platter on the pergola and relax taking in the view. The kids will love getting lost in the Bago Maze – the largest hedge maze in NSW, with 2,000 metres of pathways and hedges over 2m tall (admission charges apply to the Bago Maze - see back cover). Kick back to live music once a month, on the second Sunday. the Wicked Elf beers have won 150 plus National and International awards - thanks to top quality ingredients, carefully devised recipes and brewing expertise. All products are preservative free and unpasteurised, so there is nothing but the craftsmanship and purity of great beer that shines through. Come and taste why Wicked Elf is one of the leading craft breweries in Australia, right here in Port Macquarie. C A S SE GR A IN W INERY + R E S TA UR A N T - Minutes from Port Macquarie, Cassegrain Winery is one of the premier tourist destinations in the region, offering a range of activities for visitors. With a reputation for excellence, their award winning portfolio of wines are full flavoured, yet soft and elegant; and are enjoyed locally and internationally. L ONG P OIN T V INE YA R D + A R T G A L L ERY - A short 20 minute drive from Port Macquarie lies this charming take on the traditional vineyard. Taste their range of fine wines and liqueurs. Their famous Jolly Nose Tawny and alcoholic Ginger Beer are a must to try. Here you will discover a wonderful selection of artworks from local artists, as well as permanent outdoor sculptures. A great day out for all. L I T T L E F ISH R E S TA UR A N T + V INE YA R D - is something to behold overlooking the lush vineyards of the Innes Lake Estate and framed by Jacaranda, Poinciana and Magnolia trees. Located on Port Macquarie’s most historic road, you get to the vineyards via John Oxley Drive then turning at the Innes Lake vineyard sign into The Ruins Way. This road was the route taken by Major Innes to his famous homestead and magnificent gardens and farm at Innes Lake back in the 1830’s. French chef Steve brings his Provençal passion to the restaurant where you can experience his mouth-watering French inspired creations made with only the freshest of produce. DOUGL A S VA L E HI S T OR IC HOME S T E A D + V INE YA R D is possibly one of Port Macquarie’s best kept secrets. It is the only heritage listed vineyard and museum in Australia that is run completely by volunteers and it represents the last remaining vestige of a pioneering wine industry dating back to 1859. Port Macquarie’s oldest timber cottage, from 1863 and now a museum, sits amongst beautifully established gardens and orchard. The National Trust listed bamboo glade is the entrance for all visitors. Their philosophy focuses on the importance of ingredients. They source the freshest of local produce from our beautiful and fertile Hastings region and pair these with innovative, international flavours, letting the results speak for themselves. Finnian's Tavern A modern twist on a classical Irish Tavern. Finnian's Tavern boasts Port Macquarie’s best charcoal grill which will have your steak melting in your mouth. Along with their scrumptious cuisine, they have a massive selection of ice cold beer, wine, spirits and cocktails. All of their energetic and friendly staff have a passion for exceptional food and beverages and strive to deliver outstanding customer service and an enjoyable atmosphere to each one of their valued customers. This family-friendly locally run pub has live music every weekend showcasing Port Macquarie’s most talented artists in rotation with touring acts. So whether you’re looking for a spot for a delicious lunch or dinner, after-work drinks or a few brews or wines to unwind on the weekend, Finnian's Tavern is the place to be. Rivermark Café When you visit Rivermark Cafe, you won’t be disappointed by their uninterrupted views of the beautiful Hastings River. Open seven days for breakfast and lunch, you can sit outside in the covered al fresco dining area and soak in the waterfront atmosphere – you might even see the local dolphins swim pass! Their scrumptious menu strives for freshness and consistency and includes seafood, salad, gourmet burgers, and varied weekly lunch specials. As they are licensed, you can also enjoy a nice glass of vino from their small but interesting boutique wine selection...or simply just pop in for a Merlo coffee and cake from local artisan bakers. Rivermark Café is hugely popular with locals and visitors alike so bookings are recommended particularly on weekends...this is definitely a place not to be missed in Port Macquarie! THE H ASTING S REGION H AS A N A M A ZING DIVERSITY OF LO CA L PRODUCE. FROM SE A FO OD TO VEG ET A BLES, PASTURE R A ISED ME A TS TO ORGA NIC FO ODS, YOU CA N ENJOY THESE WONDERFUL PRODUCTS FROM OUR REGION A T M A NY LO CA L REST AUR A NTS + SPECI A L TY STORES . T A K E PLE ASURE IN THE FRESH ING REDIENTS A ND T ASTE THE DIFFERENCE. Port Macquarie’s first Gourmet Burger restaurant and proud to be voted amongst the top ten burger restaurants in Australia by TripAdvisor. After working as a fine dining chef all over the world, owner Matt Conway has returned to introduce Port Macquarie to the world of Gourmet Burgers. Matt’s love of food and all things chilli is evident and the chilli sauce display is a major feature in the shop. For those who dare to indulge, try the “Man vs. Burger” eating challenge! They have some great ales to wash down your burger and are proud to stock local brewery, Moorebeer Brewing Co. Above all, The Burger Rebellion prides itself on providing great quality food in a relaxed and fun atmosphere. All produce is sourced locally and owners Matt and Bec are passionate about getting involved in the local community. Bookings unfortunately cannot be taken but their friendly staff are always waiting for your visit. Modern simplicity is how this eatery and its menu can be described. Primely positioned in Clarence House, Bills Fishhouse dons a casual urbanity which is echoed throughout the well designed space. There’s a carefully curated sea-to plate menu. The focus has been on staying true to fresh, seasonal ingredients that underpin the brand's ethos of simple, uncomplicated eating. From delectable oysters and whole baked fish to lush quality produce from nearby local suppliers. Chargrilled is the main weapon of choice in the kitchen, and behind the bar, there's a local lineup of craft beers on tap, well executed cocktails and an all NSW wine list to impress even the most developed palate. A foodie's paradise with a buzzing vibe, Bills is the place for a shared feast with friends, celebrating a special occasion or a casual evening drink or tasty bite after a day at the beach. Bills brings people together over a mutual love of good food, good wine and good times. CRAF T B EER O N TAP. WI N E AN D CI D ER . D ELICIOUS SHA KES. G LUTEN FREE , VEG ETARIAN , H EALTHY O P TIO NS. the rebellion. People have come to be confused about what the rebellion really is. The rebellion is not in the clothes you wear, it is not in the appearance you portray, it is not in the music you listen to. The rebellion is the process of forgetting everything you know and asking the questions to what everything is again, where you are now questioning everything for you to decide, rewiring your every circuit by erasing everything you know or thought you knew and were taught. The rebellion is tough. The rebellion is not always pretty. The rebellion is first in the mind and the rebel is in the act. â&#x20AC;&#x201D; rex x. The Rainforest Café is set in the beautiful surrounds of Sea Acres Rainforest Centre. Come and enjoy the peace and tranquility of the rainforest surrounds whilst tasting some of their delicious meals, cakes and drinks. Open for breakfast, lunch, morning and afternoon tea 7 days a week. Mike’s Seafood Fancy some fish 'n' chips? Mike's Seafood (next to Rydges) offer freshly cooked seafood cooked in cholesterol free oil, grilled fish and fresh salads. Order takeaway and head over to the nearby Town Green to enjoy your feast while taking in the view of the Hastings River (sunset is highly recommended). Open 7 days from 11am. On Tuesdays from 4.30pm (excluding public and school holidays) buy 1 fish ‘n’ chips and get the second one for just $2 - you simply can’t go wrong! Eating in option also available. Little Fish Restaurant + Vineyard Overlooking the vineyard on the verandah, or sitting on the grass in Al fresco dining, the beautiful surroundings of the Innes Lake Vineyard provides a magical setting for anything from a wedding, to lunch with your friends. Originally from Provence in the South of France, Chef Steve Delandemare began cooking at his family’s vineyard and restaurant. His father’s passion for cooking with fresh produce inspired into Steve the foundations needed to become a great chef. Steve brings his wealth of cooking knowledge to the Little Fish with his french inspired menu. Come and experience the unique taste of France for yourself right here in our beautiful Hastings region. Locally owned and managed, this Artisan Gelateria makes its own gelato by hand with the aid of its specialist Italian machine. Using real ingredients, the flavours change constantly depending on whatâ&#x20AC;&#x2122;s in season and whatâ&#x20AC;&#x2122;s popular. NO artificial colours, flavours or preservatives are used. Vegan, gluten free and dairy free flavours are also available. Catering options and cart hire available. Nestled in rain-forest surrounds behind Flynn's Beach Resort, Blue Water Bar and Restaurant offers a great time for everyone. Located just a short stroll away from the iconic Flynn's Beach in Port Macquarie this locally owned family venue is so much more than a restaurant! With an outdoor children's play area, open space dining and cheeky wildlife, you can enjoy a meal or just a drink in the lush tropical surrounds whilst the kids have fun! Follow them on Instagram or Facebook (@bluecowgelato) to see what new flavours they have. So do your taste buds a favour and be blown away by the refreshing real flavours! Open Tuesday to Sunday for lunch and seven days for dinner, we look forward to welcoming you to Blue Water Bar and Restaurant. Port Macquarie Golf Club The Port Macquarie Golf Club is a favourite for locals and visitors alike. The Club is popular with those who enjoy great food, great fun or great golf in a safe friendly environment and it has been a part of the community since 1910. Throughout the week, the club hosts poker, bingo, trivia and raffles as well as golf competitions for the swingers. A free courtesy bus is only a phone call away and their friendly staff will pick you up and drop you home safely. The lunch menu provides casual fare whilst at night the team of chefs offer a more substantial range. The great food together with the modern mix of gaming services and clubhouse amenities combine to provide for an enjoyable evening out. Pancake Place The Pancake Place is an iconic part of the Port Macquarie landscape and has been operating in the same spot for almost 30 years! In that time their menu has evolved to where it is today: a delicious range of pancakes and crepes to suit all palates – and don’t be fooled into thinking they are just a breakfast location. Open for breakfast, lunch and dinner, the choices are vast and varied with a great savoury menu for the adults as well as the kids corner menu for younger family members. Pancake Place with its wondrous bright and colourful decor is truly part of the Port Macquarie holiday experience – make sure you don’t miss out. DELICIOUS DISCOVERIES. N OT E Please phone or check websites for exact opening hours. These maps are provided as tourist maps only and are not to scale. They are provided as a guide only. No part of these maps may be reproduced, copied or altered in any way without written permission of the publisher Discover Media Australia. A free high quality locally published bi-annual visitor magazine distributed throughout the Greater Port Macquarie region.